An impressive share of a country's energy consumption through wind? That is one more sign of wind energy's potential as countries look for cleaner energy alternatives. The spotlight goes on Denmark. Wind covered 43.6% of Denmark's 2017 power demand. Energy watchers are posting reports that Denmark set a wind energy record, regarding wind power in 2017. Namely, wind turbines delivered power equivalent to 43.6 percent of Denmark's electricity consumption that year. Planetsave called it a milestone. Energy Voice said the 43.6 percent number involved both offshore and onshore wind turbines. 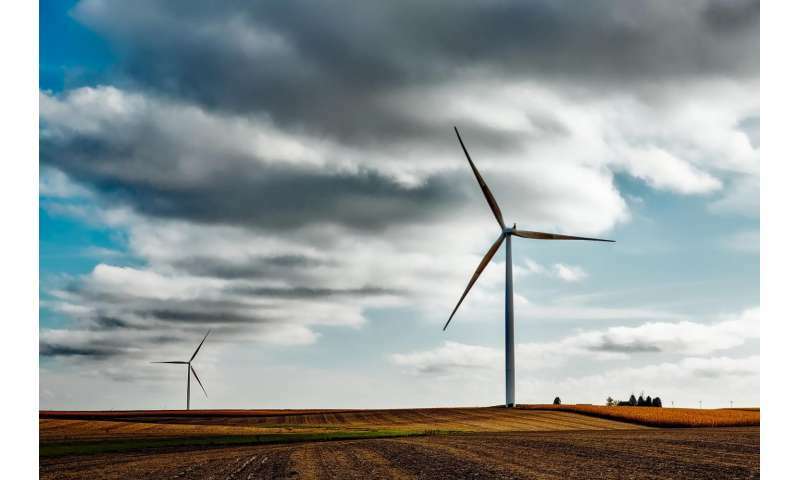 "Preliminary data from the Danish transmission system operator Energinet, published by DEA on Wednesday, show that wind farms in the country generated 14,700 GWh of electricity in the past 12 months, setting a new production record," according to Renewables Now. "By 2020, wind is expected to reach 50 percent of the electricity consumption in the country. In total, renewable energy, including solar and sustainable biomass, will cover 80 percent of electricity consumption in Denmark," wrote Jesper Berggreen in Planetsave. Interestingly, the actual number of turbines in the country is down. Currently, there are approximately 20% fewer wind turbines in the country than in 2001, said State of Green. Though the number is fewer, the wind turbines are larger and can produce more energy. Julia Simpson in Political Lore said in Denmark in 2017, about 6,100 wind turbines were in service. Overall, capacity in Denmark has more than doubled since 2001, with wind capacity installed on land and water. A number of observations about today's newer turbines surfaced along with the Denmark record news. Financial Times: "Thanks to a series of little-recognised technological advances, wind power has become far more cost-effective and prevalent than expected." Turbine generating capacity in many early wind farms 25 years ago was measured in kilowatts, wrote Pilita Clark, and produced only enough power for a handful of average-sized homes in a country such as the US. "Today they have been supplanted by far more powerful turbines that can each supply hundreds of homes." Orsted is an operator of offshore wind farms; Clark quoted its UK managing director, Matthew Wright, who said, "more electricity can be generated from fewer turbines that cost less to install and maintain than a cluster of smaller machines." All in all, "Out of all OECD countries Denmark has produced the most energy from wind turbines per capita over the last 15 years," said a report last year in State of Green. Supporters of wind energy tout it as a stable, inexpensive and clean alternative to fossil fuels. Denmark has some of the best wind condition is in the world. Its ambition to leverage its advantage in wind power goes back to 1979, when the first commercial wind turbine was installed, according to the official website of Denmark. This was a Vestas 30 kW turbine. Title sounds a little flatulent. It would also be necessary to know whether the claims are based on theoretical turbine output compared to grid consumption - or actual total KWH received into the grid? "Title sounds a little flatulent. It would also be necessary to know whether the claims are based on theoretical turbine output compared to grid consumption - or actual total KWH received into the grid?" It takes more than reading - it requires a little critical thought. Generally both and wind and solar are overstated in articles like this one. I did read it and It sounds like its metered output - but the article doesn't specifically state the actual method of measurement and determination. That was my problem. For example - "generated 14,700 GWH of electricity in the past 12 months" it sounds as if it was metered, but doesn't specifically say how that determination was made. Was it x generators at x capacity running for x hours = theoretical output, or was it a metered electrical output totaled for each generator, and all generators totaled for the 12 months? I'm not knocking Denmark's wind electrical generation, but rather the lack of critical details in the article. The theoretical output is often stated as a percentage of consumption, but may not accurately reflect the actual quantity of electricity generated given numerous variables not included in theoretical outputs. Denmark exports around 11,000 GWh of electricity yearly - most of the wind power goes out across the borders. Denmark is in the unique position of straddling the border between the European synchronized grid, and the Nordic grid. Half of Denmark pushes power to Norway, the other half to Germany - and then buys it back when the wind dies down. They are 5 a million people country in a 500 million people grid combined, so their 43.6% is actually 0.436% of the total - a neglible amount in the total scheme of things. They can have as much wind power as they like. The only limitation is that building more wind power lowers their export prices.